Innocent British drivers could be left in trouble with the police due to failings by DVLA-registered licence plate firms. According to a BBC investigation, companies which produce new registration plates are selling them without checking the buyer has a right to use a particular number. Failing to make the basic checks could, in some cases, lead to the creation of so-called cloned plates. These are used illegally to mask a vehicle’s true identity, leaving the owner of the legitimate vehicle to face fines and worse because police believe their cars have been used in a crime. The BBC investigation spoke to Adam Shirley, from Surrey, who has received demands for payment of £1,000 in parking fines after vehicles using his registration number racked up offences in places he has not been to. He told the BBC: “I’m kind of scared that someone will commit a bigger crime using a car with my licence plate on it.” In other cases, cloned plates have been used by criminal gangs to make stolen or written-off cars appear legitimate to unsuspecting buyers. 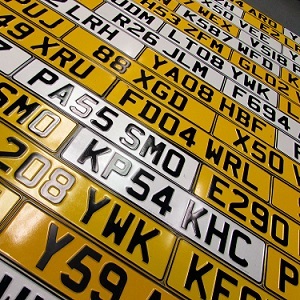 Motorists should be asked to prove their identity, address and right to use a registration number whenever they ask for a new plate to be made. However, the BBC found companies in Birmingham producing new plates in as little as 10 minutes without carrying out any checks on the buyer’s identity or right to use the registration. Neither the DVLA nor the police could provide an accurate figure for the number of cloned cars on the road, but told the BBC it was a significant problem. When a BBC undercover reporter visited one shop its staff claimed that its computer system carried out checks on the data via the DVLA. The DVLA said no such system existed. Another supplier produced copies of Mr Shirley’s already cloned plates as well as the registration of a BBC-registered van, both without asking for any documentation. A DVLA spokesperson said that it undertook spot checks to ensure suppliers were carrying out the proper checks but advised anyone concerned that their plate had been cloned to contact the police.